When you start up Fractal Domains, the window that comes up by default is set up to explore the classic Mandelbrot set. You can see some pretty fascinating images by zooming into areas around the border of the Mandelbrot set (the area in black is the Mandelbrot set) and pressing the Command-R key repeatedly to randomly change the color map. The only parameter you might have to set manually is the “Dwell Limit” parameter, which you will find by bringing up the Parameter dialog box and going to the “Dwells” tab. As you zoom in closer you will generally have to increase “Dwell Limit” from its default value. However, as striking as these images are, you will find that none of them look much like the images posted in the Fractal Domains Gallery. This is because the great majority of them were generated using the “Orbit Traps” option, which is not enabled by default — you need to go into the Parameters dialog and turn it on. 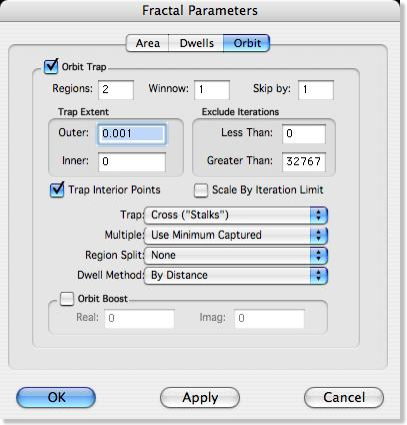 Furthermore, best results are obtained if you tweak a few other parameters in the Orbit Traps dialog. The purpose of this lesson is to show you the most basic parameters you need to pay attention to. Some of the others parameters are also important, but we will elaborate on those in later lessons. Here’s what the orbit trap dialog looks like (note, all images of windows will show the appearance of the window when using OS X 10.3. 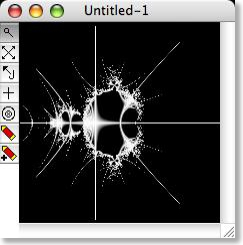 Running Fractal Domains in earlier versions of OS X or in OS 9 will result in a different appearance, but all controls and text fields will still be there). But, the most important parameter of all is the check box at the top of the panel labeled “Orbit Trap.” Everything else in the panel will be grayed out unless this box is checked. Go ahead and do this. With a new fractal window showing the standard Mandelbrot set, Open the Parameters dialog, go to the Orbit tab and click the “Orbit Trap” check box. Then click OK.
You will see a typical “stalks” orbit trap pattern with the default gray gradient color map. The color map of the background (referred to as the “exterior” region), however, clashes with this pattern. I usually set the exterior to “Black” when working with orbit traps. Regions will be discussed in the second lesson, but right now all you have to do is set the exterior region to black, which is easy to do. Fractal Domains is set to apply color maps to the exterior by default when you start up, so just go to the Palette menu and select “All Black. If you have followed the directions just described, your fractal image should now look like the figure below. We will do more with this image but first let’s take a break to talk about orbit traps and how they work.